Sunrise. Looking East. Somewhere southwest of Vernal, Utah. I'd look down after taking this photo to find a desiccated hare lying near my feet. It must have gotten hit and died there and then dried out. Odd that it wasn't disturbed by scavengers. This trip really pushes the envelope of the idea of traveling not as the crow flies. I start off in Utah and will go into Colorado, Wyoming, Idaho, and Montana though not necessarily in that order. And some days I may be go through three states more than once. Stick with me, it will all make sense...eventually. I'm staying in Vernal, Utah. This is a town in northeastern Utah, which is the gateway to Dinosaur National Monument and gives you access to the Uinta Mountains and wilderness, including the Flaming Gorge area. It also gives you access to some of the areas where Butch Cassidy, the Sundance Kid, and other members of the Wild Bunch and Hole in the Wall Gang hid out. I'll get to most of those but first, a stop at Ouray National Wildlife Refuge. Ouray National Wildlife Refuge is located 27 miles south of Vernal, Utah. 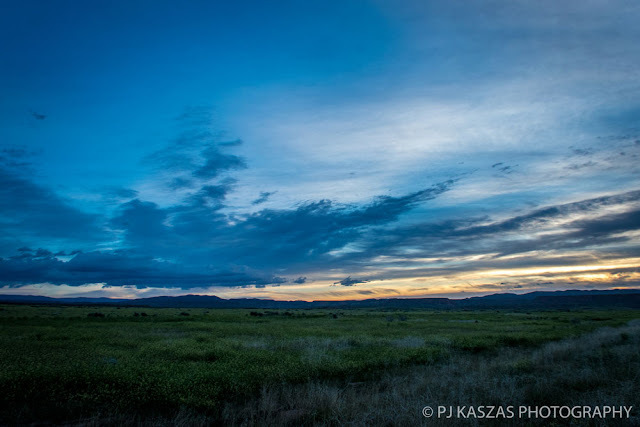 Though this arid place averages 8 inches of rain or less per year the Green River feeds a rich mixed riparian, wetland, cropland, and grassland habitats in this area. It is critical habitat for migrating birds and other wildlife, including four species of endangered fish: the humpback chub, the bonytail, the Colorado Pikeminnow, and the razerback sucker. I was searching for birds and other wildlife. 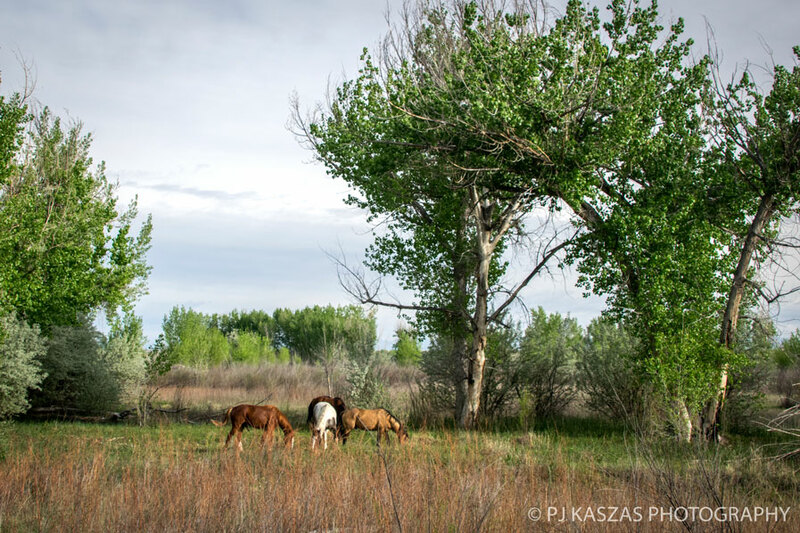 I did not expect the huge surprise I found hiding in the cottonwood trees later on my journey through the refuge. 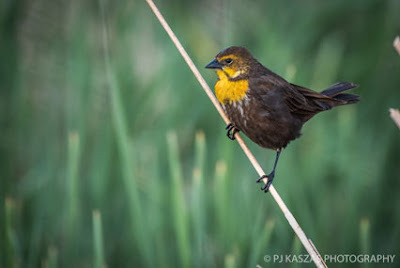 As I drove toward the refuge entrance I saw a bird that had originally planted the idea of coming out west in my head years ago: the yellow-headed blackbird. I don't know why I was so enchanted with the idea of seeing one but I was. I saw them on a program about an artist that lived in Bozeman, Montana. I've forgotten the artist's name but I never forgot the birds (which probably says way too much about how I think about things). And there were my yellow-headed blackbirds, lining the fences of a field across from a pond alive with Redhead ducks, Mallards, and American coots. They glistening in the morning sun made into rainbows by center pivot irrigation machines. More greeted me as I stopped at the visitor's entrance to the refuge. 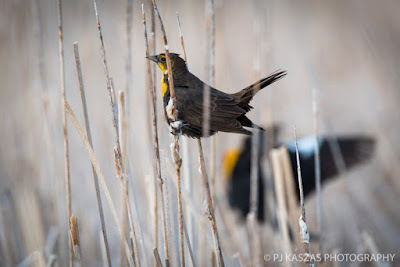 Yellow-headed Blackbird,female in foreground, male flashing in background. 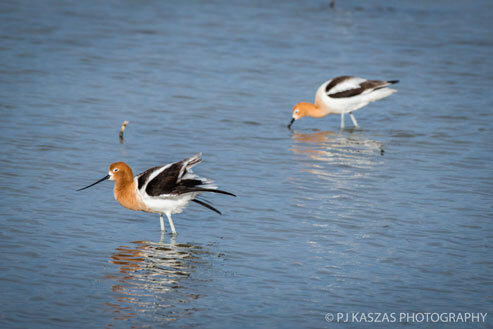 There is a 12-mile auto route through the refuge that provides ample opportunity to hike and photograph wildlife. 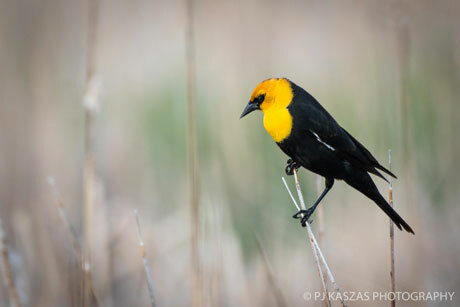 I spent some time photographing yellow-headed blackbirds, of course. 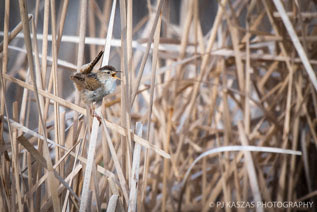 Then I discovered many marsh wrens being incredibly noisy as they went about their business, which mainly seemed to consist of making as much noise as possible. But I also kept hearing the sound of clopping hooves or horses trotting or stomping. 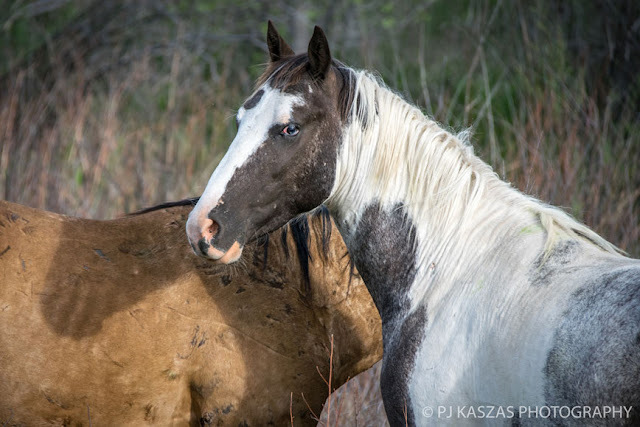 I figured riders were out on the other side of the marshes in the wooded area of the refuge. But there were what looked like stud piles all over the sanctuary. Stud piles are places where wild horses tend to leave their droppings as a way to mark territory and gather information on other horses in the area. There was more manure out there than seemed normal from just casual riders going through the refuge. But I didn't spend too much time on the mystery as I was hearing turkeys in the distance, as well as Canada geese. Plus I had many birds grabbing my attention. Black-neck stilts, American avocets (another bird I've been trying to see forever), Redhead ducks, mallards, and a duck I have yet to identify all feeding in the shallow water of the marshes. Red-winged blackbirds squabbled in the reeds. Then a Cinnamon teal cause a duck jam of sorts. It insisted in staying in the middle of the road. I had to wait for it to decide to move before I could proceed. As I drove further into the wooded, areas yellow warblers battled each other, flitting from tree to tree and bush to bush. And three mule deer made an appearance and then just as quickly disappeared into the cottonwoods. 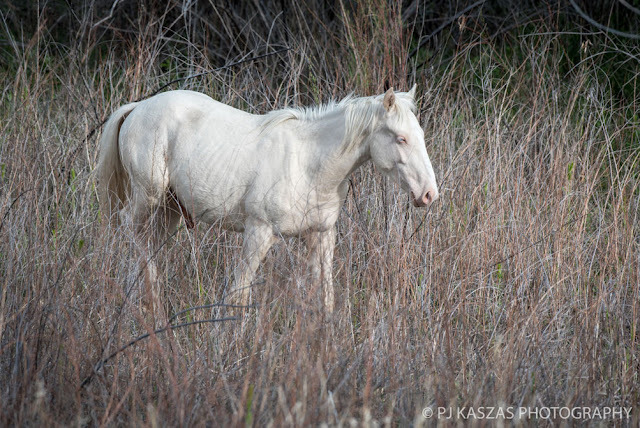 I started to follow them hoping that they would reappear as I drove around a corner in the direction they had headed. But that would not be what I found around that corner. 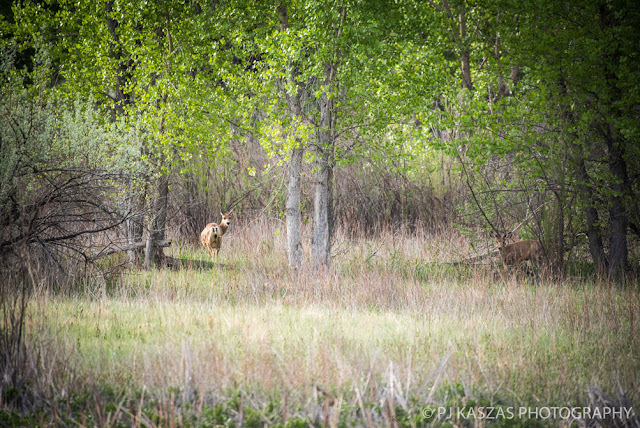 Can you find the second mule deer in this photo? 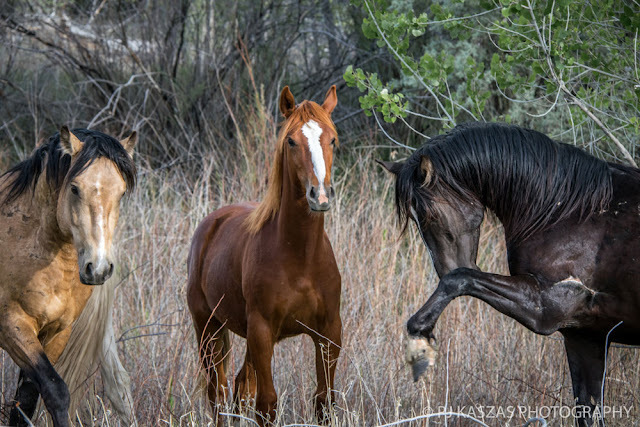 What I found around that corner were four beautiful horses. All boys. They were soon joined by three others. 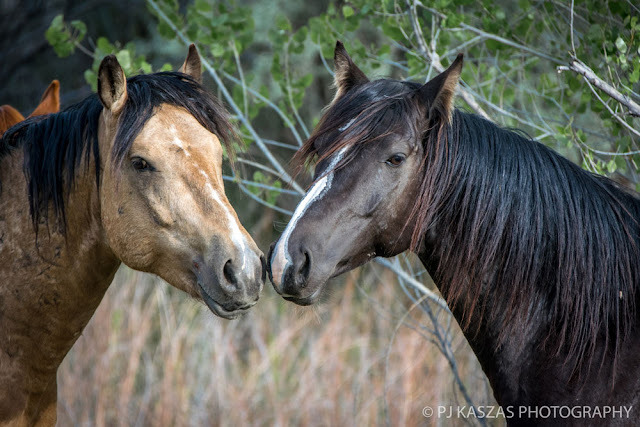 It was a group of bachelor stallions. This explains the stud piles. 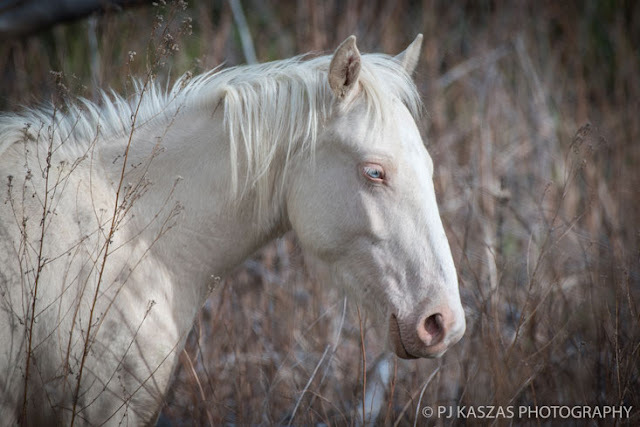 There was a dun, a cremello, a graying pinto, a chestnut, and three bays, one a big dark bay stallion. 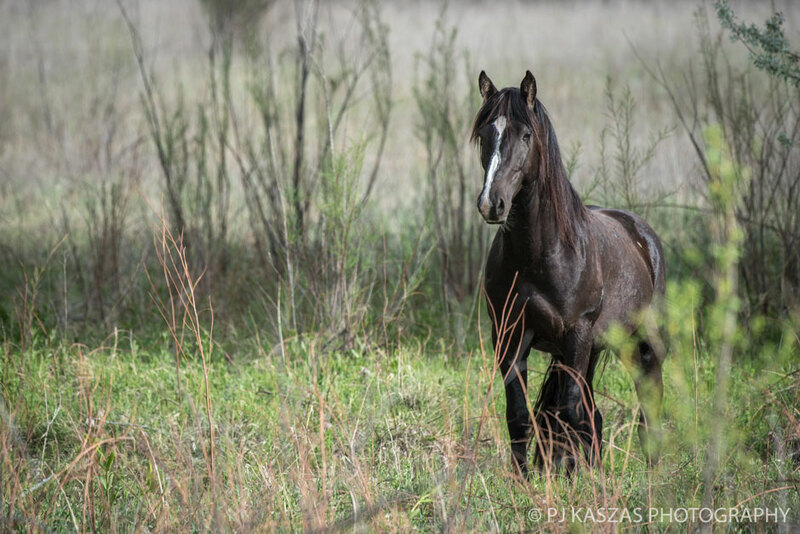 That dark bay stallion had the most amazing battle scars I've ever seen on a horse. These are not mule deer. 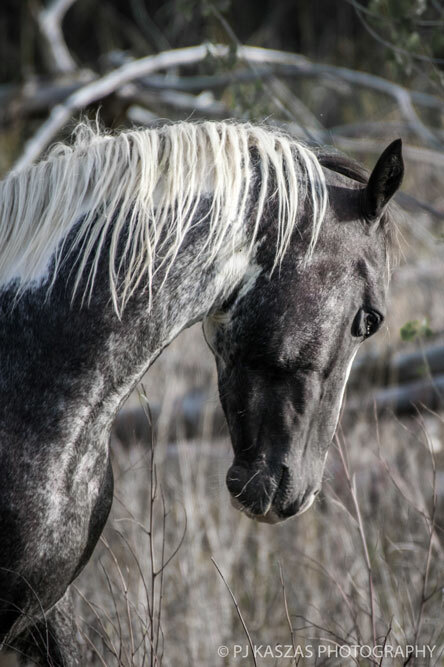 A closer look at the graying pinto. 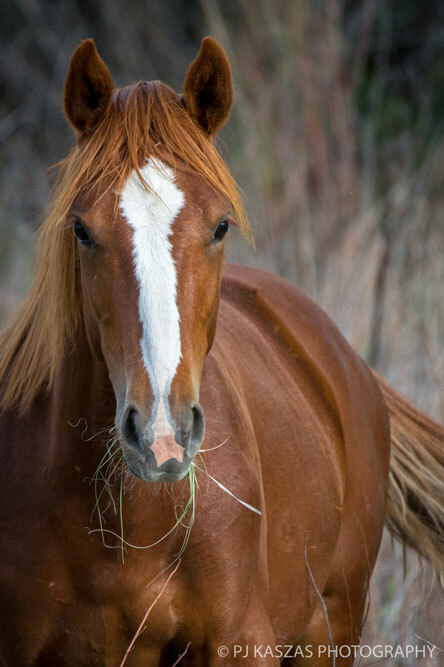 Look closely at the pinto's eye. It's partially blue. The dun gets motivated. Why? Because he's about to get challenged. So what are these horses doing in the refuge? 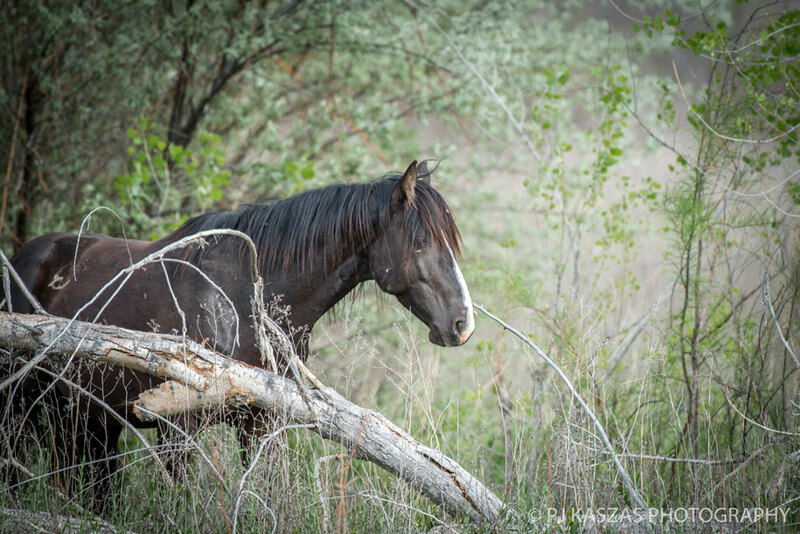 The BLM allegedly zeroed out (removed) the horses of the Bonanza HMA (Herd Management Area) that is located near this area. 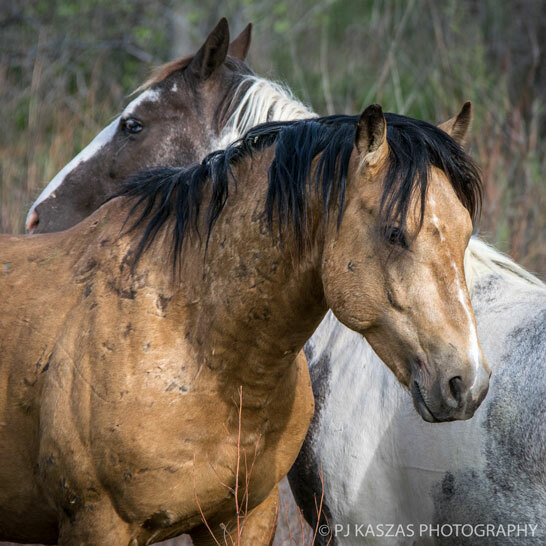 The BLM may claim these are horses that wandered off the Uintah and Ouray Indian Reservations but they could easily be from other known wild horse areas in eastern Utah, western Colorado. 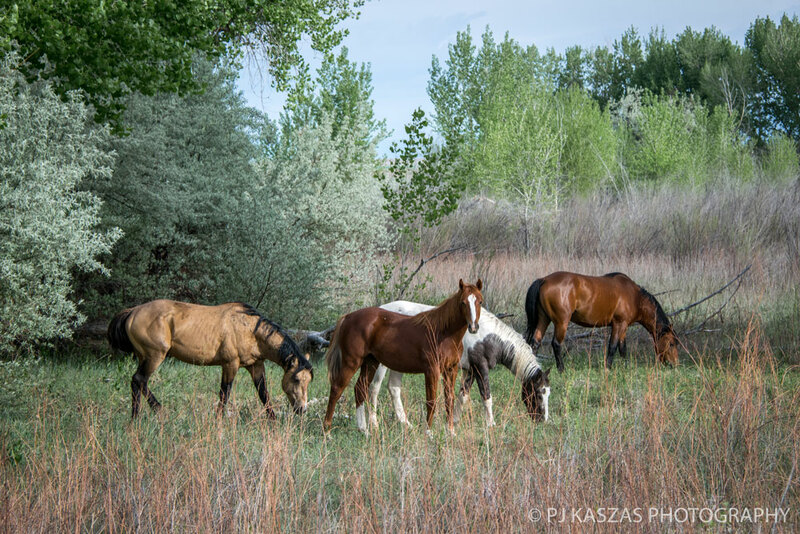 Whatever their origin, these bachelors are living just like wild bachelor horses (those who haven't taken a mare yet or are too old to keep up with the antics required to keep a band of mares) the world over. They were a joy to watch and spend time with. The dark bay (notice the scars) challenges the dun. They are just having a normal status interaction here. Dark Bay is just asserting his dominance. This amazing guy was napping down in a gully and I could quite see him. And then he came out of the underbrush. Wow. A beautiful cremello with blue eyes. The Dark Bay takes notice of the new arrival (the Cremello). Not much came of the newcomer's arrival. I get the sense Cremello is low in status. Chestnut and Dun grooming each other. One of the two other bays joins the group. The other was too far away to photograph. On the way out of the auto tour/refuge you come across a white-tailed prairie dog town. Watch out. They have dug their holes/homes right in the middle of the road. I watched as two tumbled in a fight down the road past my car. I wished them luck with not getting run over in the future. Then driving back to Vernal I saw a red-tailed hawk and vultures circling. 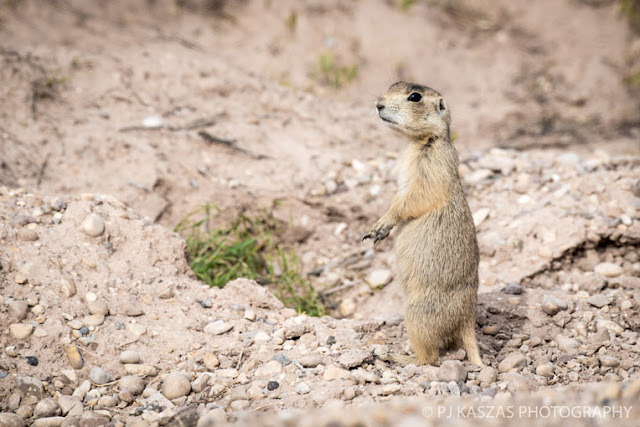 White-tailed prairie dog. 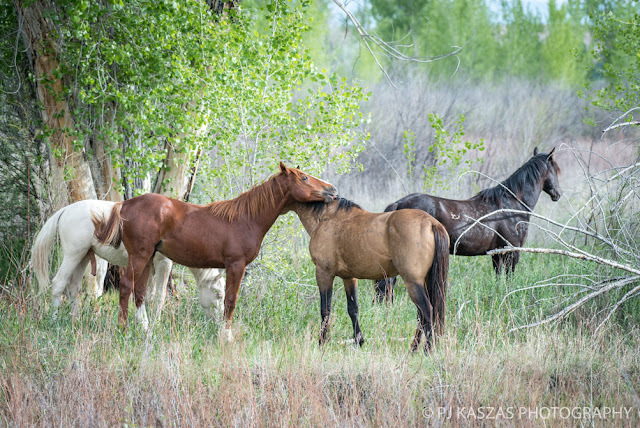 These are a different species than the black-tailed prairie dogs that show up in my previous posts. They are a lot more rare. 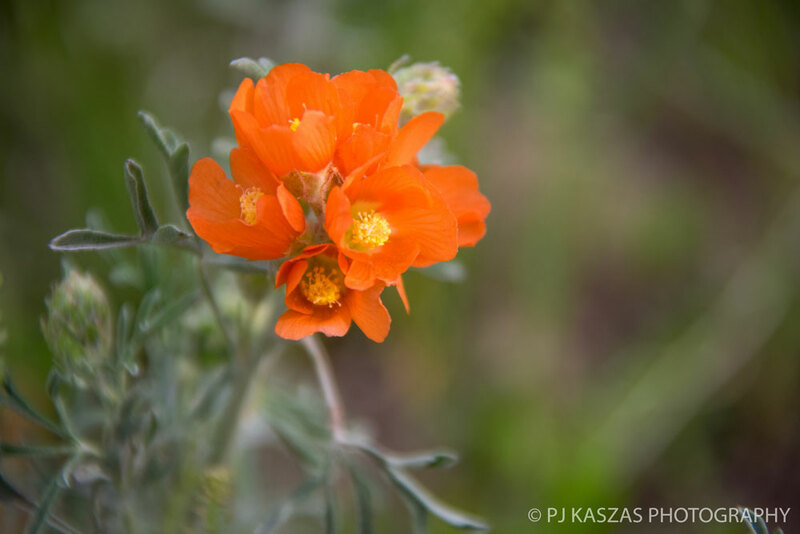 Globe Mallow. A common site in these arid areas.